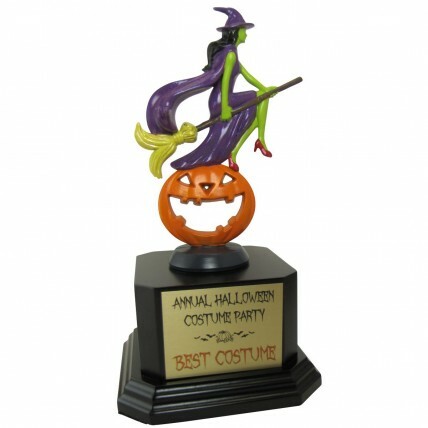 Our Halloween Witch Trophy will be the hit of your next Halloween party! Hand painted by our in-house graphic designer Lori Nichol, this one-of-a-kind Halloween trophy features a full color witch figure riding her broom. The witch has black hair, green skin, and a fabulous sparkly purple dress and cape with red high heels! This darling witch trophy sits above a orange jack-o-lantern attached to a square black base. Your customized message is printed in color on a metal plate and attached to the base for FREE! You won't find these handmade witch trophies anywhere else, a Trophies2Go exclusive! Each Halloween trophy is unique because hand-made in Washington State. Limited quantity of these handmade Halloween trophies, please call for availability.